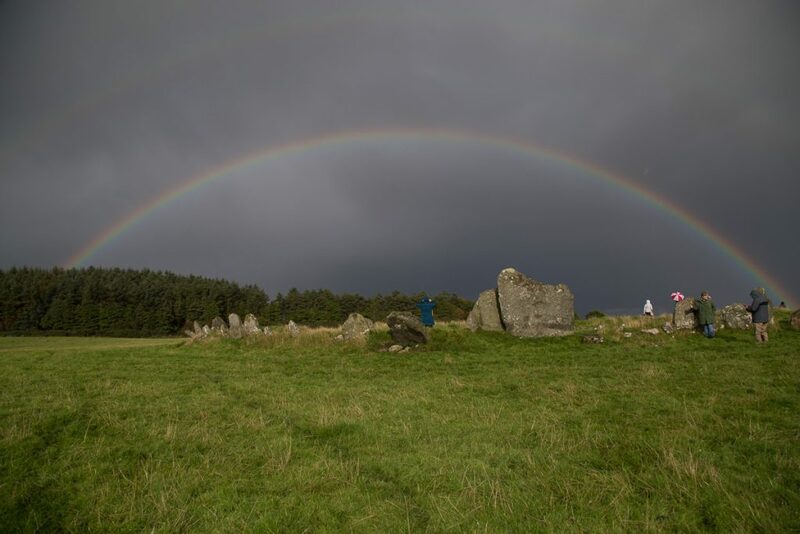 It appeared as if it was a bridge to the Otherworld… the rainbow we saw at Beltany stone circle on the eve of the Autumnal Equinox. The vision was certainly otherworldly. After seeing such a display there’s always the urge to make some kind of sense of it. To find some meaning. Every culture has its own symbolic meaning for the rainbow. Most traditions focus on connection, a bridge to the otherworld, a promise from God, a sign of hope, a call to follow one’s heart. On the eve of the Autumn Equinox, I led a group up the path to Beltany stone circle in County Donegal. It was wet, rainy and overcast. The field approaching the circle was littered with cow dung. Several of my group turned back finding nothing particularly mystical about Beltany. But for those of us who stayed, the landscape shifted dramatically within fifteen short minutes. 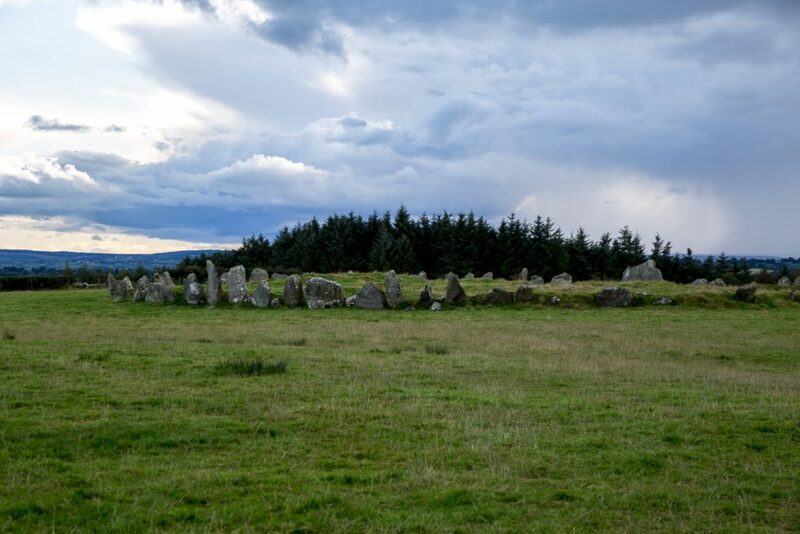 Beltany stone circle dates back to 1400 – 800 BC. With its 64 stones averaging 6 feet in height, it is larger than most found in Ireland. The circle measures about 145 feet in diameter. The site was significantly disrupted during an early twentieth-century excavation leaving the center of the circle lumpy with stones now covered by grass. Most believe that there were at least 80 stones in the original circle. A wide triangular stone with cup markings immediately draws the eye and stands out from the others (shown to the right in the image above). It faces ENE and stands directly across the circle from the tallest stone (about six feet high) which points WSW. When the two stones align they point to the summit of a hill across the valley. 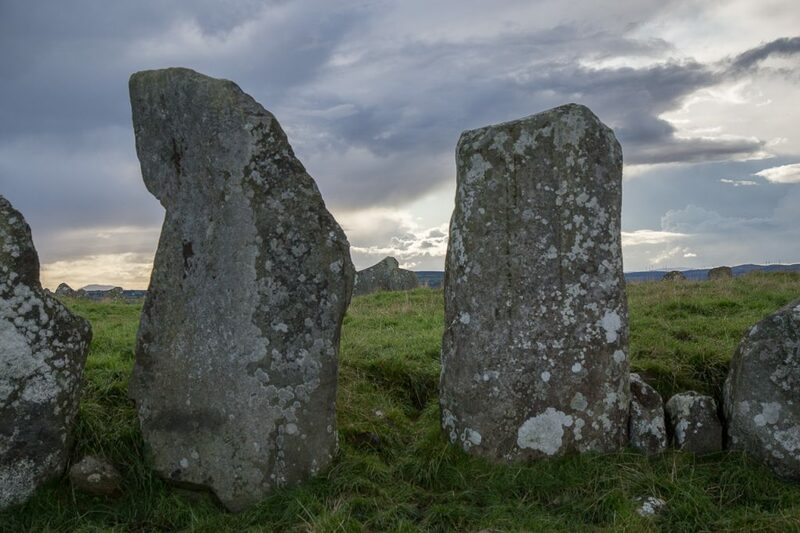 On May 1st – the feast of Bealtaine – that the sun rises over that hill and aligns with these two stones. 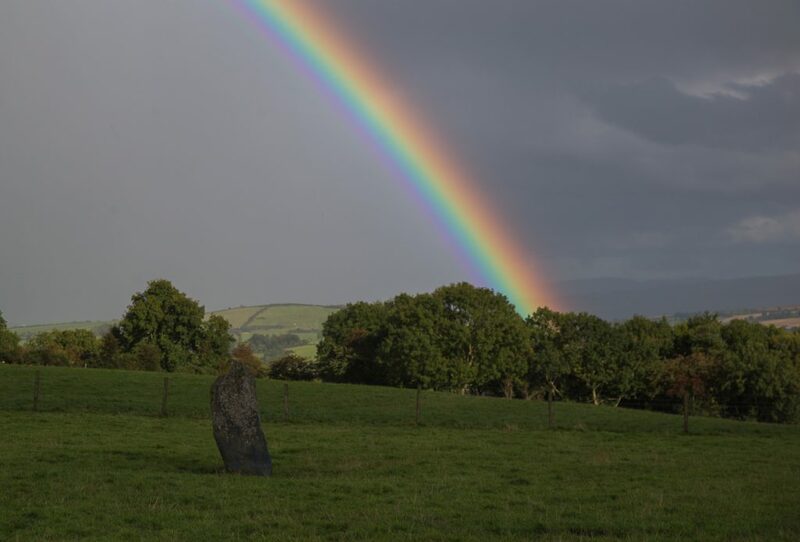 The circle’s name, “Beltany” likely refers to this celestial event and the feast of Bealtaine. 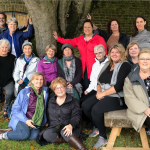 As we walked up the secluded path to the open field where the circle stands, my tour group was tired, the skies were gray and there was a slight drizzle. 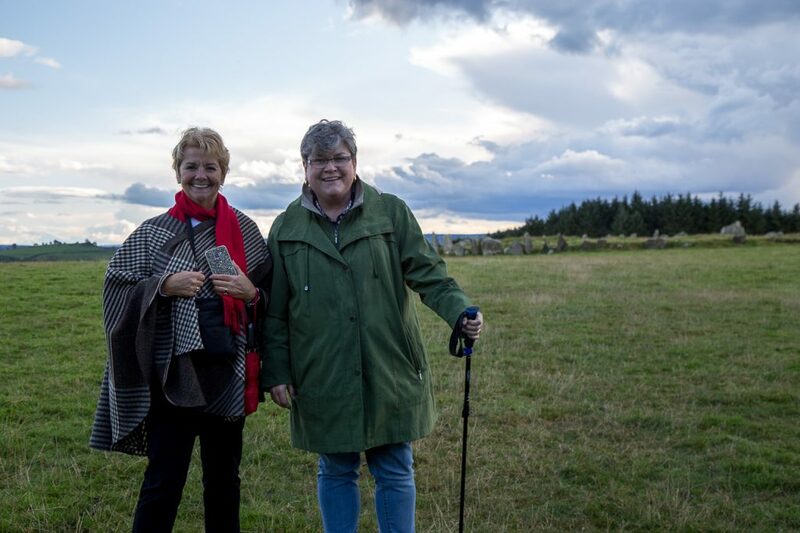 I was disappointed because I wanted my guest to love the circle as much as I did, but I could see that some of them remained on the bus and others exited quickly due to the difficulty of walking through a wet cattle field. I had only a portion of the tour group at the circle. Then it started to pour. My heart sank. I want so much for this to be a perfect experience. But sometimes the weather won’t cooperate. But sometimes the weather and the landscape surprises us. As the rain softened, I happened to turn around toward the entrance to the field. I saw a pretty vibrant rainbow that was halfway across the sky. I called out to my tour guests to look at it. No one said a word – we just stared. Then together we watched this rainbow spread perfectly across the sky over the circle. Then a second one appeared over the first. The clarity of the colors was stunning. Then we noticed that there was a darkness or shadow between the two bows. 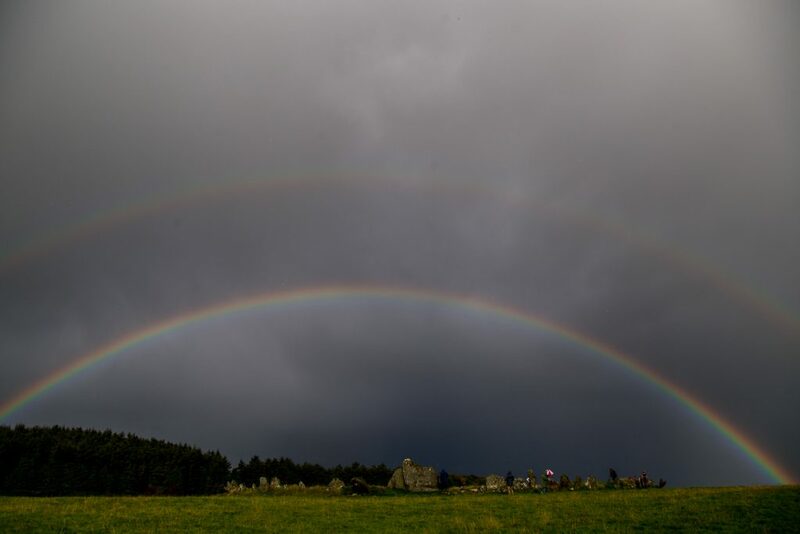 The space between was charcoal colored – different from the sky making the set of rainbows appear to be one thing. Even the sheep in the field were looking up at the rainbow. One of my guests said, “In my seventy-one years of life, I have never seen anything like this.” It almost seemed as you could walk out to the end and touch the rainbow. Then the same guest pointed out that the colors were reversed on the second rainbow. Each rainbow was a reflection of the other with the colors going in opposite order – a perfect reflection – a mirror image. Traces of a third rainbow could be seen at the edges of the second. A rainbow is a fusion of light that projects a harmonious – almost supernatural specter of all the world’s colors visible to the human eye. Every culture in every time has been moved by the sight of the rainbow. It nudges us to find some meaning in the presentation of something so spectacular. The Judeo Christian tradition is rooted in the book of Genesis. The first nations in North America, as well as many Asian cultures, saw the rainbow as a bridge or passage between the earthly and spirit worlds. 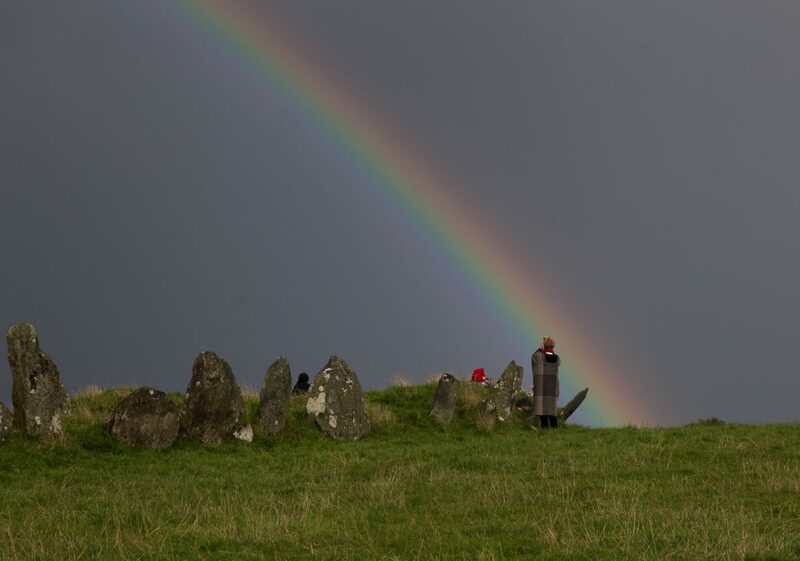 The ancient Irish or pre-Christian Irish saw the rainbow as a sign of blessing – the arc symbolized femininity – the rounded belly about to give birth, which is so appropriate for Beltany because the circle was likely created to celebrate that feast which encourages and blesses fertility and birth. The rainbow was often interpreted as a promise of good luck, abundance a sign to follow the heart’s desire or follow your dreams. We’ve all heard of the old Irish saying to follow the rainbow and find the “pot of gold.” The rainbow was often interpreted as a promise of good luck, abundance a sign to follow the heart’s desire or follow your dreams. And standing at the edge of that circle and seeing the pulsing vibration of light against the field, one can perceive an actual “physical” end of the rainbow. Almost as if the pot of gold could be within reach. The light is mesmerizing. Follow it over the hill and stream. In the end, it doesn’t really matter what the rainbow means or doesn’t mean. Just standing in the presence of such a sight was gift enough for me. And it will always be a part of my memories of Beltany. 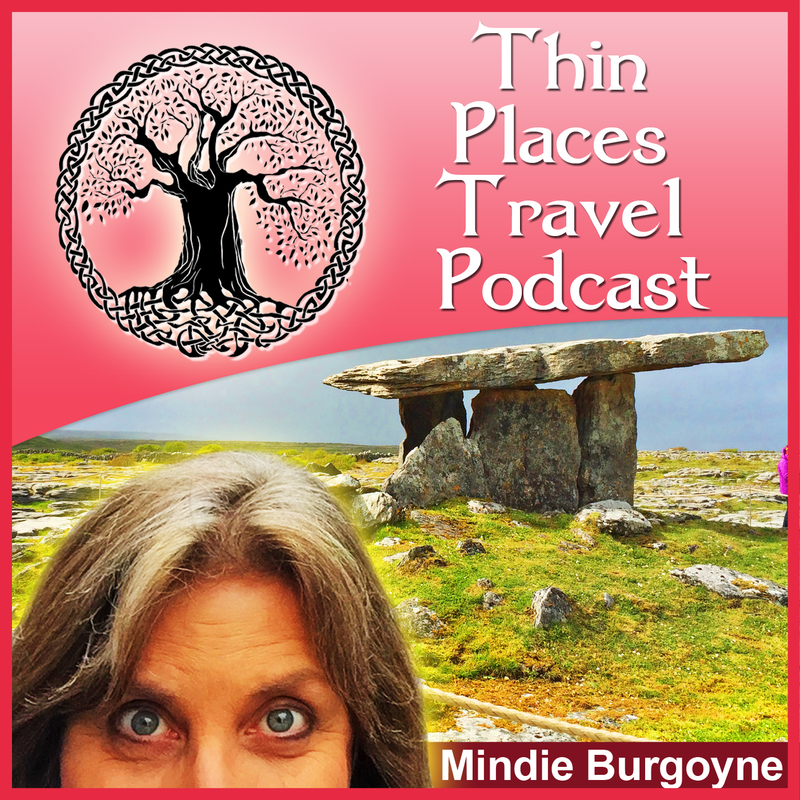 Owner of Thin Places Tour. It was so beautiful. I saw it briefly but was thoroughly touched by the excitement of the others on the Tour. Even the most skeptical had a certain childlike thrill.